The core engine is the heart of the Project and allow us to execute Business Processes in a flexible manner. It is light-weight Workflow Engine in Java that executes our Business Processes. Human Task Service is an important part of a BPM. It provides the Human Task life cycle if some task needs to be executed with the interaction of human actors in the business processes. It is a runtime Persistence which persists the state of all our process instances and log audit information about everything that is happening at runtime of the processes. It connects our application with the core engine through Java API or as a set of CDI services and also connects remotely through a REST and JMS API. It allows business users to design and simulate Business Processes in a web-based environment. It provide a graphical editor for viewing and editing of our Business Processes by using drag and drop option. It also supports simulation of processes. It allows for the non-technical users to view, edit and create data models used in their Business Processes. The data modeler tool provides both logical and physical data models without the need for explicit coding. It allows us to create, generate and edit forms related to our Business Processes or during Task execution. This modeler tool help us to create forms without the need of any coding or templates markup skills. It provides WYSIWYG environment to model forms for the less technical users. It allow us to specify different types of Business Rules for the combination of our Business Processes. These Business Rules are decision tables, guided rules etc. 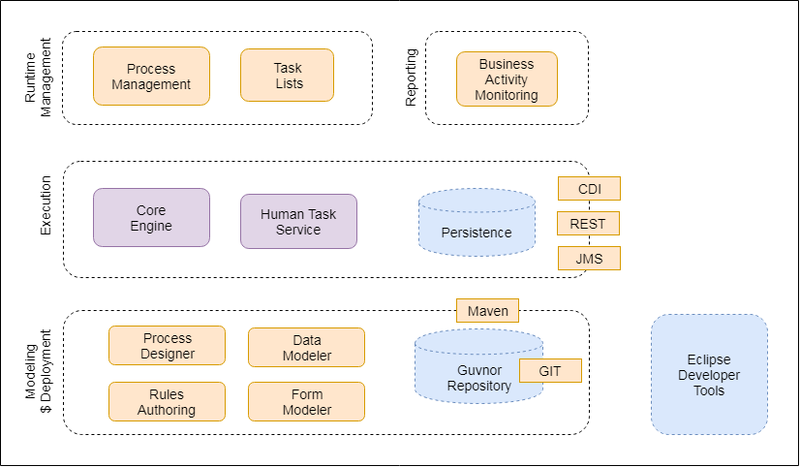 All types of assets used in the Business Processes are stored and managed on the Guvnor Repository. Process can be managed through the web-based management console. It includes features like managing our process instances i.e. start processes, stop processes and inspect the running instances, manage and executing Human Task lists and generating the reports. It is a set of plugin to the Eclipse IDE and allow us to integrate our Business Processes in our development environment. It help us to create Business Processes using drag and drop option, test and debug our processes etc.